​The first thing I do on 10ft 6ft wide island custom cabinets is I am going to fist make a template. I use a quarter inch plywood. I would template the together and then draw the curves in the template. I am going to draw curve for all four corners of my template because I don’t want any corner on my island for this example. In figuring my curves for the custom cabinets I am going to put my raised panels at a curve. What people used to do is they would create one raised panel at a time and build it one by one for the outline of the kitchen custom cabinet. Today I am going to do it a new way. The way I am going to do it is put a support bored on the inside of the joining area of each style. Now each bored I am going to make is going to have to diagonal cuts making a wide arrow at the top. Next I am going to figure out how many raised panels I am going to put on the top of my custom cabinets. The support beams are made of 2”4s. For this example I am going to put a style at the beginning of both sides of the start of the curve and two evenly spaced in the middle. Just to be on the safe side I am going to add an extra style just encase I always leave myself room for error on any part of the custom cabinets. 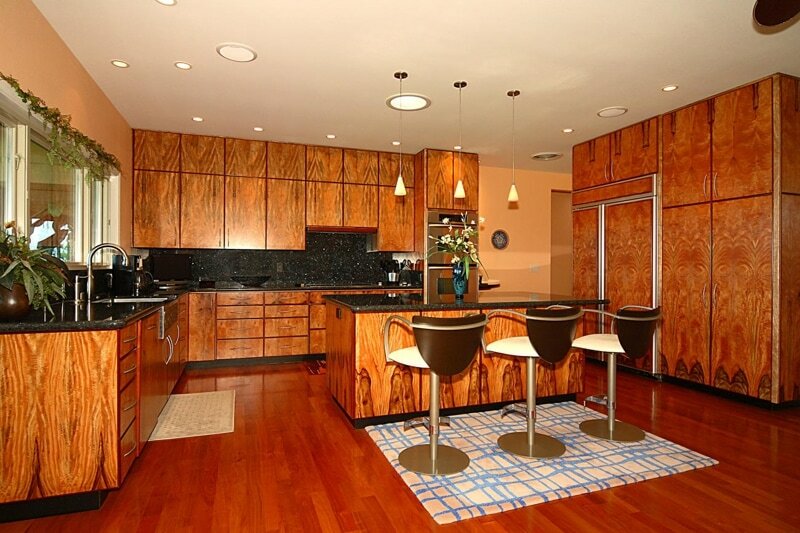 I really appreciate diagonal incisions because they give the custom cabinets added strength. The triangle is actually the strongest shape if you didn't know that. When you give the cabinets diagonals you create four triangles and if you're thinking long term with your custom cabinets you want to make them as string as you can. This complements the rest of the custom cabinets beautifully. The solo stools sit on the carpet of the kitchen so it doesn't scratch the wood.